Brittney Cox is an associate in the New York office of Hughes Hubbard & Reed LLP. Brittney has substantive experience in the areas of intellectual property, products liability and new media, entertainment and music. Brittney is active in providing legal services to the music and fashion communities, representing emerging singer-songwriters, festivals and music rights organizations in connection with contractual and licensing matters, and international fashion brands in relation to trademark matters. 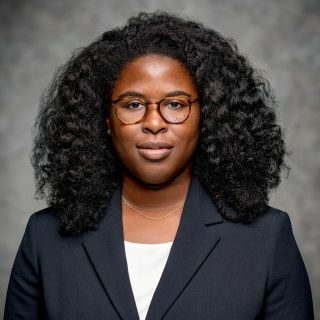 Brittney is Co-Chair of Hughes Hubbard’s Black Attorney Affinity group, is a member of the firms Diversity Committee and an active member in the LGBTQ Attorney Affinity Group. Prior to joining Hughes Hubbard & Reed, Brittney held legal extern positions in the New York offices of the Brooklyn Nets and Atlantic Records. While at Cornell, Brittney served as Vice President of the LAMBDA Affinity group and as an executive board member of Cornell’s Black Law Student Association.